Collins Booksellers - 1133 Questions: An Interventional Cardiology Board Review by Debabrata Mukherjee, David Moliterno, Leslie Cho & others, 9781496386205. Buy this book online. Publisher's Note: Products purchased from 3rd Party sellers are not guaranteed by the Publisher for quality, authenticity, or access to any online entitlements included with the product. 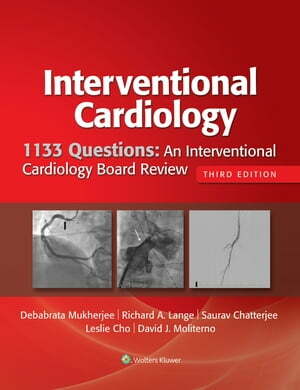 With two new editors and hundreds of new questions, this comprehensive new edition of 1133 Questions: An Interventional Cardiology Board Review, continues to serve as the perfect study aid for anyone taking the American Board of Internal Medicine (ABIM) interventional cardiology board exam, either for the first time or to recertify. You’ll have everything you need—detailed answers and explanations for each question and plenty of relevant images—to pass the exam and improve your ability to provide effective and evidence-based patient care.